Dynamic Dial is the fully autonomous dialer in turboDial that greatly simplifies the dialing steps for your Calling Agents while also giving complete control of the dialing session to the manager. The result is your agents are more efficient and your prospects are treated more respectfully. 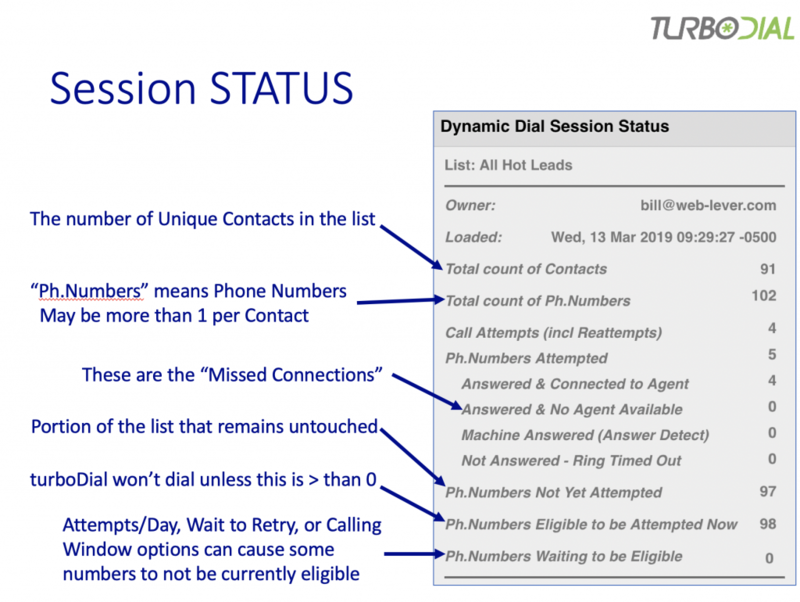 This video walks through the steps for a Calling Agent to use Dynamic Dial for calling a list. The Session Owner has the role of configuring the Saved Search in Infusionsoft and then setting up the Dynamic Dial Session in turboDial. This video walks through the details the Session Owner needs to fully understand the optional settings for a Session. The Supervisor must be specifically authorized in your turboDial Management Account. An Authorized Supervisor will have access to the tools for Monitoring calls in Dynamic Dial Sessions. Q: Will a call that ends up as a “Missed Connection” be eligible to be reattempted? A: Yes, generally speaking when a call results in a Missed Connection the number will be eligible to be reattempted. The exception is if you have the “Notify on Answers w/No Agent Available” option enabled. In that case the Contact is turned over to be manually dialed and that Contact’s numbers will not be eligible for further attempts during the current Session. Q: Will a call that is answered by a machine be eligible to be reattempted? A: If Answer Detect is enabled then your Missed Connection recording will be left as a voicemail message and that number will remain eligible for future dial attempts. – If you leave a voice message manually or hangup without leaving a message then the number will not be eligible for future dial attempts during the current Session. Q: Can an inbound call be handled by an Agent who is currently joined to a Dynamic Dial Session? A: The Call Pickup feature in Hosted Voice gives your agents the option to temporarily leave the Dynamic Dial Session and pickup an incoming call.